Pleasant. Holidays, constant sunshine, camaradie. Ten days sailing the Whitsunday passage; fishing, oysters, prawns, tropical fruits, idyllic scenery. Island hopping in a Grob 109 motorglider tween times. Quite pleasant. The yacht was heading off in the morning, time to move on. Over dinner aboard we discussed venturing further north, to Cairns and across to the Gulf of Carpentaria, then back to Southern Queensland in time for the last day of the 1989 Qld State comps and the inevitable party. Luc, our Belgian skipper, whose hobbies include jumping out of perfectly good aeroplanes (and Blaniks), waxed lyrical on the beauty of a spectacular aerial event he had witnessed years before during one of his epic motorcycle journeys; he described an amazing roll cloud stretching from horizon to horizon, churning in from the Gulf at dawn. Rob Thompson and I knew what he meant. Morning Glory. During our introductory studies of wave formations, we had seen photos and had pipe-dreamed about flying this fantastic phenomena, which seemed more fearsome than the rotor we were being constantly warned of. Rotor is like surf churning as the wave breaks, and just as a dumper breaks bodies and boards, so rotor can dismember aircraft and embarrass pilots. ...I saw the wreckage from just such an incident at Omarama in the Southern Alps of New Zealand. Weatherworn pieces adorned the high pasture between two peaks and had been there for years. The Morning Glory is a wave formation, and the visible portion of it is rotor. Known to the boffins as atmospheric undular bores, formations of this type are thought to occur at many locations throughout the world, but none are as visibly spectacular nor as predictable in their period of occurrence as the event of Northern Australia. 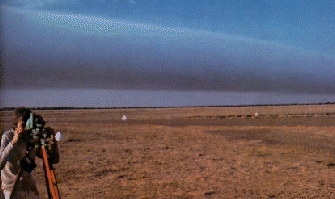 A pair of roll clouds, apparently generated by a thunderstorm, were detected off the northern coast of Western Australia in 1986. These continued north for 18 hours and 1400 km! The generation of the Morning Glory is still not well understood, but a simplified explanation is that when two opposing sea breezes meet on the Cape York peninsula during the night, a combination of inversion and trade winds causes a sort of shock wave to head west. If conditions are favourable, cloud forms to mark the passage of the wave, and the Coriolus effect causes it to gradually curve around to the south. Satellite pictures indicate its length to be 400 to 500 km. The available literature contains such chewy terms and phrases as "vertical-velocity isotachs" and "surface anemograph traces", "horizontal uniform potential- temperature distribution " and "nocturnal solitary-wave- dominated disturbances". Consider this: "...the BDO- equation necessitates the solution of the linear eigenvalue problem" I certainly can't argue with that. After wading through all this, I had to smile. Picture a group of dedicated scientists staring out to sea in the pale pre-dawn light, waiting for the Cloud to appear as it has many times in their weeks of study. One turns to adjust an instrument, and his eyes open wide in astonishment. There is the cloud, almost on top of them, right on cue. Coming from the opposite direction. Which it does, apparently, but rarely. Two rollclouds can meet from opposite directions; convergence lift would take on a whole new meaning. The hapless glider pilot on such an occasion would probably need a pressure suit. To Townsville the following morning was a pleasant flight, and the voice from the tower advised traffic of Foxtrot Foxtrot November "apparently a motorised glider". It came as something of a surprise to me to find that what I expected to be another sleepy Queensland airport was in fact a major control zone and RAAF base, long rows of jungle green camouflage Hercules and helicopters and acres and acres of hangars. We repaired to the aero club for lunch and extra Wac charts. Fifteen customers in the canteen with table service was a far cry from frozen-pies-in-the - microwave and money-in-the-tin gliding and aero clubs we were accustomed to in western NSW. After studying the routes to the Gulf, we abandoned Cairns and planned departure from Townsville the following morning. A devastating airline pilots strike was at its height, so we had the place more or less to ourselves. An intriguing mixture of Federation charm and Queensland crass, with its large quota of service personnel Townsville displayed a proportionate number of colourful women in the vicinity of such tastefully named establishments as the Hard-On Bar, next door to Fanny's Restaurant. We rang Barry Wrenford (who reputedly invented mountain wave) at Jindabyne in the Snowy Mountains, who put us in touch with Wally Wallington. Wal had flown the 'Glory' in a Twin Comanche whilst accompanying a meteorological expedition from Monash University studying the wave system. He was very enthusiastic about its soaring potential, and told us that now, in October, was the best time of year to encounter the wave, and the best place would probably be Burketown, in the south eastern corner of the Gulf. The remainder of the evening was spent poring over maps, rigging an ELT from a nautical version filched from Lucs boat, and fantasising outrageously about flying from end to end on the Morning Glory. We set forth on a cloudless morning across the Great Divide. As the day wore on and the bush turned to scrub I saw why Flight Services had raised an eyebrow at our lack of navaids. The inversion was way too high to get above, & below the visibility was poor: the lift strong but very broken. A very unpleasant few hours across the desert, the glider bucking and lurching ceaselessly and the haze abetting the featureless horizon to make compass navigation a considerable chore. A larger jolt dislodged Robs hat, as he snored gently beside me. He awoke when I replaced it so I took the opportunity to ask him if he knew where we were. He rubbed rub his eyes, peered ahead and down and around, glanced at his watch and pencilled a mark on the map. And went back to sleep. Part homing pigeon. Halfway across we landed at Georgetown, and were promptly met by the local fuel agent, who had dashed out thinking we were in trouble when he saw us but couldn't hear us. We rattled & bumped into town in his Landrover to find a flock of Robinsons in his backyard, resting up from mustering longhorns, two Jetrangers due later in the afternoon. Half the town turned out to witness our departure. The other two stayed in the pub. A nasty patch of sink at the end to the runway had us hugging the scrub uncomfortably close, the next thermal miles and miles away as we followed the road and sweated through the interminable sink. Mt Isa flight services warned of dust storms due Burketown at five o'clock, only 30 minutes after our ETA. We discussed the merits of landing at Karumba 90 miles from our destination. Rob was keen on a discretionary landing, though I wanted to push on. "No sense of adventure," I suggested. "Keen sense of survival, though," he replied laconically. Once a thriving fishing port, the prawns have been mostly fished out, and Karumba now has an air of decay about it. The airstrip is conveniently placed very close to town, parallel to and 20 metres from the beach. A brisk sea breeze blew directly across the runway. The Grob has an Achilles heel: a cross-wind component of eleven knots. At Mackay, our gallant attempt to dovetail with traffic in unfavourable conditions had elicited sarcastic comment from the tower, so when final approach at Karumba strongly suggested a transverse landing it was with some relief I went around and queried Rob "Burketown?" He confirmed sufficient fuel return Karumba if we failed to beat the dust storm to Burketown, which on the map looked easy enough to locate. Just follow the Alfred river. But the Gulf is like one huge delta, with serpentine waterways everywhere making navigation a nightmare - and this in the dry season. In the wet it must be forbidding indeed. When we landed floodmarkers on the road indicated that the strip may be sometimes submerged. After securing the glider against the impending storm (which vanished somewhere out in the desert,) we repaired for a cool ale to the Bouketown Pub. It was six o'clock, and the temperature in the bar had dropped to 32c. The pub, to my great surprise, was segregated. Blacks to the left, Whites to the right. Later I realised that this segregation had nothing to do with Apartheid ,but rather cultural barriers, and there were actually three groups. The first of these we met outside: the blackest people I had ever seen sitting placidly outside on the thin grass just outside the door greeted me in a friendly manner and with an embarrassed G'day I ducked inside (to the right). Home. Typical Aussies pressed against the horseshoe bar, and opposite, in the 'black' bar, blokes & sheilas who looked straight out of Redfern to my Sydney city eyes. Dramatic pictures of the huge grey cloud adorned the pub walls amongst the stuffed fish and crocodile jaws and turtle shells, the boomerangs and woomeras and sawfish blades. An antique barramundi fisherman was introduced to us as the local authority on the Morning Glory. He spoke softly and very slowly, using two shaking and weatherbeaten hands to sip his beer as he told of his life in the Gulf country. The cloud, he said, had been through a week or possibly two before, and he shook his head sadly as if mourning its passing. You'll know when it's coming, he said, if there's a heavy dew in the morning the Glory'll come. A phone call to Sydney that evening informed me of disaster at work, precluding any extension to our stay in bustling Burketown (population 250 says the proud sign at the airstrip. I think they count the emus too) so after a short trip out to the river to watch the crocodiles cruise downstream in the brief tropical dusk, it was a weary and somewhat gloomy pair which turned in. Without the alarm clock, which we had left in the plane. The plan, such as it was, was to arise predawn and launch at first light, fly out into the Gulf for an intercept, and ride the cloud to Mornington Island for a landing. A sweet dream, but our hopes weren't high. I surfaced to Rob's dulcet tones querying someone outside whether it had rained overnight. The sun was streaming in. I caught only one word of the someones reply. Dew. Rob vanished westward, and before I could adjust the shower taps, he was back. "It's coming." Holy jumping canetoads, I muttered, as we tripped over one another in the rush. We shanghaied the publican who drove us out to the strip, (another decrepit Landrover seemingly stuck in low gear) nervous glances at the looming cloud threatening to overtake us. The preflight was not unhurried, and we lined up on the runway just as the cloud rolled overhead, very low, eclipsing the sunshine as it went. We caught it halfway down the strip, the windsock still indicating nil wind, turned low and faced this great grey Chiko Roll at 400 feet. The vario went up a knot. The tension in the cockpit went up rather more. At a thousand feet we throttled back, well established in 2 knots of lift, rising rapidly in front of the vast mass of cloud. I looked at Rob for confirmation, thinking it time to switch off and soar, but he had a look about him suggesting disbelief. Another long minute passed before I killed the motor and feathered the prop. The silence was eerie as we continued to rise, awestruck by the spectacle. It was truly a magic moment. Broken when we started giggling, congratulating ourselves, joking about writing an article starting "After months of careful planning ...," and feeling really quite ecstatic. Our luck was certainly in. We sobered up after a while, broke open the emergency rations, munched apples and muesli bars, and began taking stock of the situation. Altitude 3000, time 0630, tracking SSW at about 30 knots, position ..... umm. We exchanged sheepish grins. Our position was thus. We were over unknown, inhospitable, mostly unlandable country, soaring out into the desert on a previously untried wave formation which may continue to Alice Springs, for all we knew. Without a map. In our haste we left it at the hotel with the rest of the kit. All was not lost, however, for should worse come to worst we could go over the top of the cloud, fly back to the Gulf and turn East till we came to the point we saw yesterday, and follow the Alfred river back inland to Burketown. We climbed to 4400 for a look behind. Interesting. A thick layer of cloud extended north to New Guinea. Cloudbase at 500' or less made the prospect of going underneath unappetising, so we did the sensible thing and called mother. Mt Isa flight service got very chatty when they learned what we were up to, so we didn't burst the bubble by mentioning anything so mundane as maps, or lack of them. After all, we knew pretty much where we were. Sitting on a cloud heading south, more or less. A bush pilot joined the chat and said he thought it petered out about 50 miles inland. We hoped he was right, and decided that when the time came, we would land, perhaps on a road if no cattle stations were in sight, two of which we had overflown, and wait for cloudbase to rise, before following plan A. The cloud was actually a fairly mild example, not as well formed as the few we had seen in photos, and the lift was weak compared to the one the venerable Wallington buzzed. He reported lift exceeding 5 knots to 6000 feet, which would probably translate to considerably more in a glider on a good day. We were only able to use the eastern end of the cloud, what's more, as the cloud to the west had broken into something resembling cumulus, and as it rose there much higher we were unable to estimate the total extent. The useable portion was about 60 or 70 km long, and there was a distinct hump in the inversion visible at the eastern end. The lift became apparent at about 400ft well in front of the cloud,perhaps 2km, and remained very broad at altitude. Cloudbase about 500 feet, top 3200, travelling around 25 knots WSW. After a time the lift died. With a vengeance. The whole system just collapsed in about 5 to 10 minutes, all the clouds evaporating into a clear blue sky, so we fired the motor and headed home. To our surprise, the secondary and tertiary were still working well, and in fact it would have been quite easy (though a little scary) to have soared all the way back to Burketown strip, which we found with little effort thanks once more to Robs great navigating. Later, back at the strip before departure for the long trip south, we filed the flight plan, dated Friday 13th. While Rob chatted happily to the chaps at Mt Isa, I plucked a purple flower from the vine growing over the airstrip shed. Convovulus Purpurea. Morning Glory.